You think working in a fast-food restaurant is hell? This place is worse. All the employees are zombies. 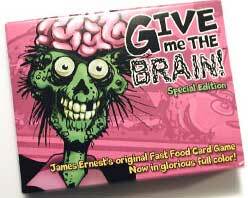 In this 3rd edition of the award-winning card game by James Ernest, all the players are zombies, shuffling and moaning through their horrible jobs. Whoever gets rid of all his jobs first will win. Some jobs actually require a brain... and there's only one in the whole restaurant... and the zombies keep dropping it. This game has the same setting as Lord of the Fries.